Our main aim was to explore whether pre-diagnostic circulating levels of 25-hydroxyvitamin D (25(OH)D) among older individuals with cancer were associated with overall and cancer-specific survival after diagnosis. We used data from the Reykjavik-AGES Study on participants (n = 4,619) without cancer at entry, when blood samples were taken for 25(OH)D standardized measurements. The association with cancer risk, all-cause- and cancer-specific mortality was assessed among those later diagnosed with cancer, comparing four 25(OH)D categories, using 50–69.9 nmol/L as the reference category. Cancer was diagnosed in 919 participants on average 8.3 years after blood draw. 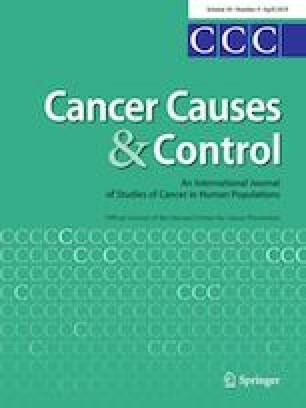 No association was observed between the reference group and other 25(OH)D groups and total cancer incidence. Mean age at diagnosis was 80.9 (± 5.7) years. Of those diagnosed, 552 died during follow-up, 67% from cancer. Low pre-diagnostic levels of 25(OH)D < 30 nmol/L were significantly associated with increased total mortality (HR: 1.39, 95% CI 1.03, 1.88) and non-significantly with cancer-specific mortality (HR: 1.33, 95% CI 0.93, 1.90). Among patients surviving more than 2 years after diagnosis, higher pre-diagnostic 25(OH)D levels (≥ 70 nmol/L) were associated with lower risk of overall (HR: 0.68, 95% CI 0.46, 0.99) and cancer-specific mortality (HR: 0.47, 95% CI 0.26, 0.99). Among elderly cancer patients, low pre-diagnostic serum 25(OH)D levels (< 30 nmol/L) were associated with increased overall mortality. The online version of this article ( https://doi.org/10.1007/s10552-019-01143-9) contains supplementary material, which is available to authorized users. We thank the participants for their willingness to participate in the study. The authors’ responsibilities were as follows: VG, MFC, TBH, and LT provided essential materials for the study. JET, TA, UAV, LAM, ELG, MJS, and LS designed the research; JET performed the statistical analysis and drafted the manuscript; JET, TA, UAV, MFC, HOA, LAM, ELG, MJS, and LS interpreted the data and critically reviewed the manuscript; JET and LS had primary responsibility for the final content; and all authors read and approved the final manuscript. The AGES-Reykjavik Study was funded by NIH contract N01-AG-12100, the Intramural Research Programs of the National Institute on Aging and the National Eye Institute (ZIAEY000401), the Icelandic Heart Association, and the Icelandic Parliament. Vitamin D analysis was supported by the European Commission under its Seventh Framework Programme (ODIN; Grant Agreement No. 613977). For this project, Johanna E. Torfadottir was funded by the University of Iceland Post-doc grant and the Public Health Fund of the Icelandic Directorate of Health. The funding agencies (National Institute on Aging, Icelandic Heart Association and Icelandic Parliament) for the AGES-Reykjavik Study, University of Iceland, or Directorate of Health had no role in the design, analysis, or writing of this article. None of the authors declared a conflict of interest.